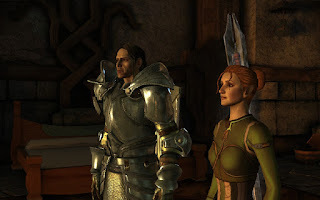 If you really want to understand the world of Dragon Age, then Dragon Age: Origins is simply essential, because when it comes to worldbuilding, DAO sets up the chessboard beautifully. It introduces you to Thedas, and to the Dragon Age universe's main regions and races, their politics, religions, and strifes. DAO also tosses you headlong into the fray by making your first protagonist a Grey Warden. as a world that's equally complex. Grey Wardens are a grim, highly honored, elite cadre of fighters who either join the order out of ambition and pride, or who are forcibly conscripted. Much like GRRM's Night's Watch in the Game of Thrones universe, Dragon Age's Grey Wardens do an often thankless job around the fringes of Thedas's world, fighting darkspawn, haunted by the "Taint," and doomed to die within two or three decades. They're often a disparate mix of nobles and criminals and everything in between, because, as with the Night's Watch, once you become a Grey Warden, your past crime no longer exists. Those wishing to become Grey Wardens must first undergo the Joining, a ritual that involves drinking a concoction of darkspawn blood, and which the majority of potential Wardens do not survive. Those who do survive are now Grey Wardens—respected throughout the land but doomed to live shorter lives due to the "Taint," and marred by a constant awareness of, and connection to, the darkspawn (a hellish, twisted, mostly mindless race that lives beneath the surface, and which can infect those in contact with them). At least you're not alone in your newfound Grey Wardenship. You're immediately paired up with Grey Warden Alistair, a witty, slightly naive young man who has the potential to be either a friend, lover or foe as your adventures evolve. The stage of DAO is then perfectly set with the reappearance of the one thing everyone in Thedas dreads: the appearance of an Archdemon. Archdemons are fell forces in dragon form, and each time they appear, they lead the darkspawn in something called the Blight, in which the darkspawn rage to the surface in massive, frenzied numbers as they attempt to take over the world of the living, obliterating whole villages, settlements and kingdoms. The Blight is basically a kind of infection that's both biological and metaphysical, in which those infected either die of the infection or slowly turn into darkspawn themselves. 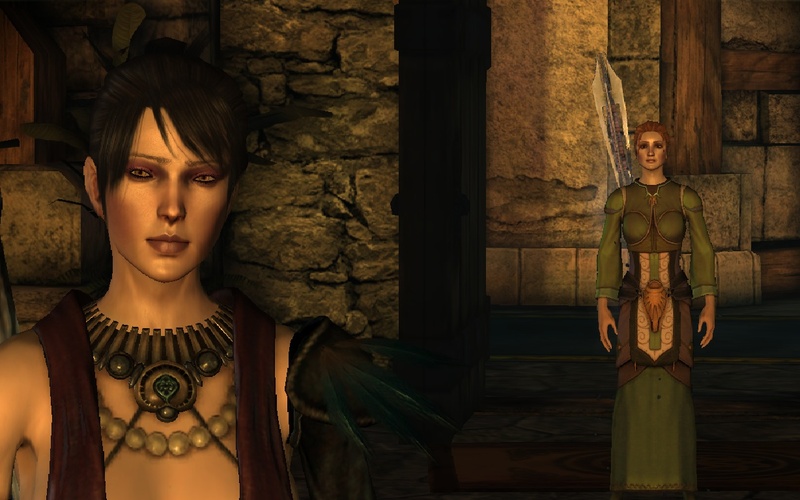 The other main tensions are between mages and templars, and these tensions not only affect the game and its choices in DAO, but they will be increasingly vital in shaping each new chapter of the trilogy as it progresses. 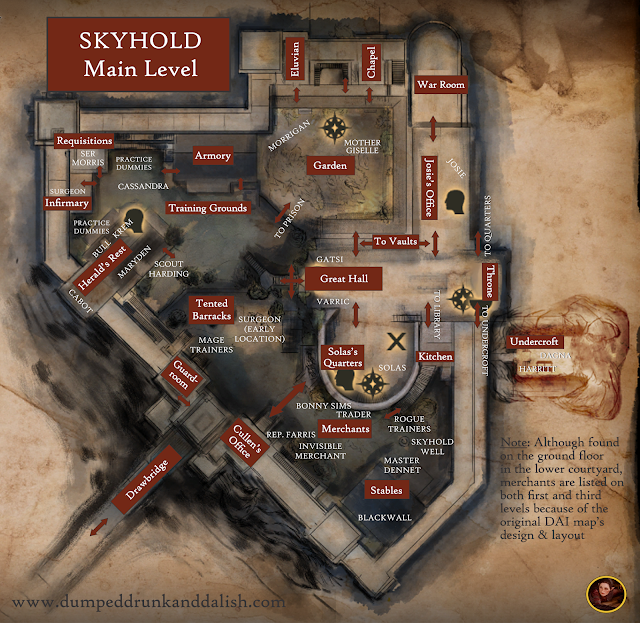 In the Dragon Age universe, mages are innately talented with magic, yet they're also dangerous because each time they use magic, they open a tiny channel to the Fade (the otherworld/dreamworld that is also the source of all magic), allowing for the possibility for demons to sneak through and possess them, turning them into powerful, evil Abominations. Mages are for this reason tested for this weakness in a Fade-based ritual known as "The Harrowing," and if they fail, the templars in the room will execute them immediately. Those templars, meanwhile, are soldiers who guard, watch and imprison the mages, and who keep them in isolated towers known as 'Circles,' ostensibly for their own protection. Some Circles are gently managed, and there's real camaraderie between the mages and Templars (along with a healthy degree of sly hooking up), and a system that mostly works, even if I still intensely dislike any system that requires imprisonment for a talent people were, you know, born with. Other Circles, as we'll find as we move through the trilogy, however, are not kind, gentle, havens, but are horrifying prisons in which mages are starved, abused, raped, and more, without consequence or oversight. Mages who flee are often punished with death or a kind of spiritual lobotomy known as "Tranquility," in which the mage's connection to the Fade is severed, and they lose all capacity for emotion. The first Circle we encounter is fairly gentle, however, and it includes a character we'll come to know very well as the trilogy progresses—the templar Cullen, who here in DAO is a shy young boy who cannot even stand a moment of flirtation with your female mage protagonist without running away. It's part of the reason I really recommend playing DAO at least once as a Circle mage, as you'll encounter plenty of drama and prejudice—even more so if you play a Dalish or city elf, as elves in this universe are a fallen people, distrusted, enslaved, and treated with active cruelty and prejudice. And you'll learn about the central conflict (mages versus templars) that will evolve with each new game or chapter as you progress through the trilogy. instance (although I'd envisioned standing ON him). So what are the tasks set for our brave Warden protagonist as the game gets underway? Navigate Thedas's complex politics, gain allies, avoid the machinations of the usurper Loghain, gather a team of intrepid companions, fight your way across Thedas, and defeat the Archdemon. No big deal, right? It's a great journey, and full of adventures across a complex and often beautiful array of regions and landscapes. Even better, you'll encounter some amazing characters, societies, and stories along the way—from werewolves to enchantresses, from dragons to demons. And, as always with RPGs, you get to choose how—and who—you play. Are you a hero? Or a villain? Or a wisecracking rogue somewhere in between? It's all up to you. You can court—or kill—pretty much all of your companions. The choices are complex and often surprising, frightening, and even moving, and Origins ensures that the dialogues are consistently complex, engrossing, and genuinely interesting and fun to navigate. Meanwhile, DAO is about far more than the hero—it also offers incredible characters. I loved the richness and complexity of the apostate witch Morrigan, the guilt-stricken Qunari Sten, the charming Alistair (hiding some secrets of his own), the Crow assassin Zevran, the devout former bard Leliana, senior mage Wynne, the golem Shale, and others. The characters are—all—beautifully performed, especially by Sten's dry, yet secretly heartfelt Mark Hildreth, Morrigan's sarcastic, vulnerable Claudia Black, Kate Mulgrew as the mysterious Flemeth, and more. I grew to love them. Origins is like playing a great novel, and every choice you make has consequences. And each consequence can, in fact, carry forward into the events of Dragon Age 2—and into Inquisition itself. The plot thickens... DAO is only the beginning.